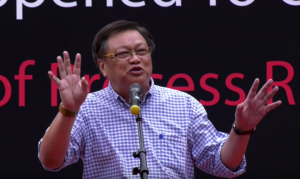 In his 10-minute speech at the rally, he did not fail to question the government’s expenditure on social welfare, CPF, public housing, and healthcare. One of the problems confronting Singapore society is the housing. Housing and Development Board (HDB) was also criticized by Leong for not being upfront with Singapore’s population, despite being persistently asked to reveal the breakdown of HDB flat costs. With regards to healthcare, Leong attacked the government on its failure of assisting the people in times of need. He cited a situation of how MediShield Life insurance was not able to pay the eye surgery costing to thousands of dollars of an elder Singaporean as he was only eligible to use S$4.50 from it. To help Singaporeans cope with high and rising healthcare costs, Leong proposed that health insurance MediShield Life and forced savings scheme Medisave should be improved. Over the past ten years, Leong said, there is a S$180 million in budget surplus accumulated by the government. With his speech, Leong stood in his arguments that Singaporeans are the most taxed, least-helped people in the world. Sued by PM Lee for alleged defamation, he brought his voice in front of the rally attendees. A few days ago, Leong, represented by Lim Tean, applied to the High Court to Strike Out Prime Minister Lee Hsien Loong’s Defamation Action against him. It was in November last year that PM Lee filed a libel suit against Leong. The latter shared an article on Facebook alleging that Lee had helped Malaysia’s former premier Najib Razak to launder money from the country’s state fund 1Malaysia Development Berhad (1MDB).